“Ryan Thomas never finished better than fourth at a collegiate cross country meet until this past weekend when he went out and won the Paddy Doyle Meet of Champions hosted by Iona. In a meet loaded with three teams from the top-30, including his own #30 Lions, Thomas covered the 8K tract at Van Cortlandt Park in 25:31.7 to beat Iona’s Jack O’Leary by two seconds and lead his team to victory. Thomas also toppled Arkansas’ Alex George and Cameron Griffith, both of whom finished inside the top-50 at last year’s NCAA Division I Cross Country Championships. Columbia now sit as #2 in the Northeast region. The Harvard-Yale-Princeton meet was the 2017 opener for the Yale squad as they contested the annual tri-meet on Yale’s home course. While it was Princeton who won the meet with 32 points to Yale’s 39 and Harvard’s 63, it was Yale junior Andrea Masterson who dominated the meet. Masterson won the women’s race by 10 seconds with a time of 13:45.1. Yes, the course was only a 4km distance, but we can only imagine how big the gap could have been if it was the championship distance of 6km. The Yale women now sit as the #2 team in the Northeast region, while Harvard has dropped to #6 (previously #2) while Princeton moved up one spot in the Mid-Atlantic region to #6. 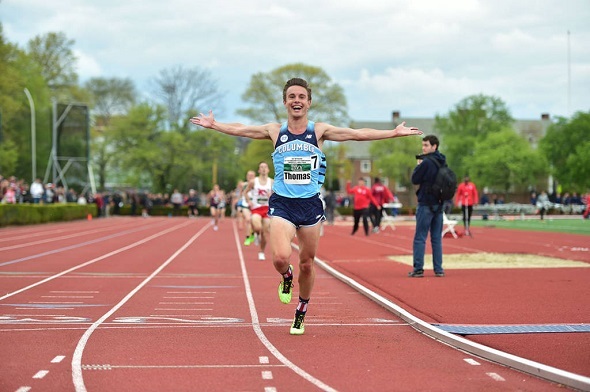 Yale freshman Nick Dahl – an eight time New Balance All-American in high school – was the top rookie in the Harvard-Yale 6km race on Saturday, finishing 4th overall with a time of 19:39.0. Dahl was the second Yale finisher of the race as Yale had three freshmen finish in the top 10 of the meet. Yale beat Harvard in their annual dual meet with a score of 23 to 36. The Columbia women also had a successful day at the Paddy Doyle Iona Meet of Champions. The Lady Lions won the Division 1 team title, led by rookie Serena Tripodi. Tripodi finished fourth overall and third scoring athlete on the 5km course in 18:45.1 behind an unattached runner and a pair of Iona athletes. The win also helped the Lady Lions in the regional polls as they are now sitting in fourth in the Northeast Region. This entry was posted on Monday, September 18th, 2017 at 8:25 pm. It is filed under Athletes, Featured, Spotlight. You can follow any responses to this entry through the RSS 2.0 feed.